I’ve always been pretty proud to have bilingual kids. They’ve been in French immersion classes since preschool and are not, as I witnessed in the interview, functionally bilingual. 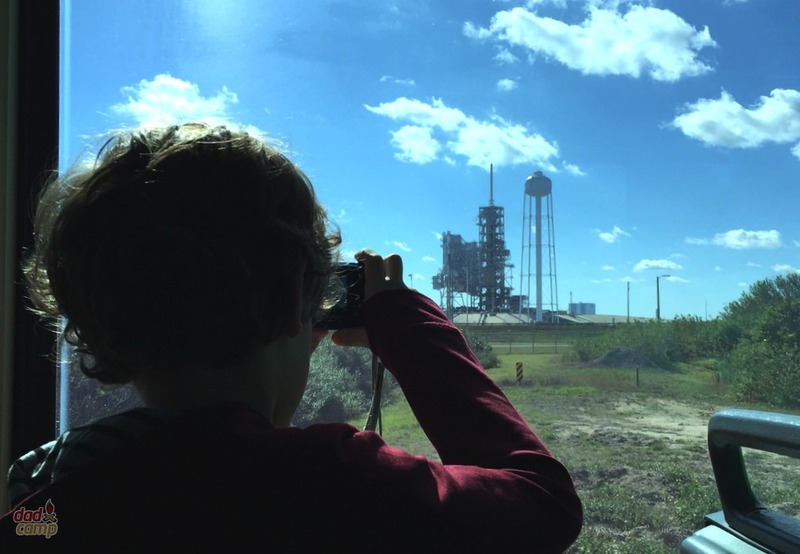 Will they use the skills later in life? I don’t know, but I knew that learning a second language is easiest when your young, so I gave my kids the head start. 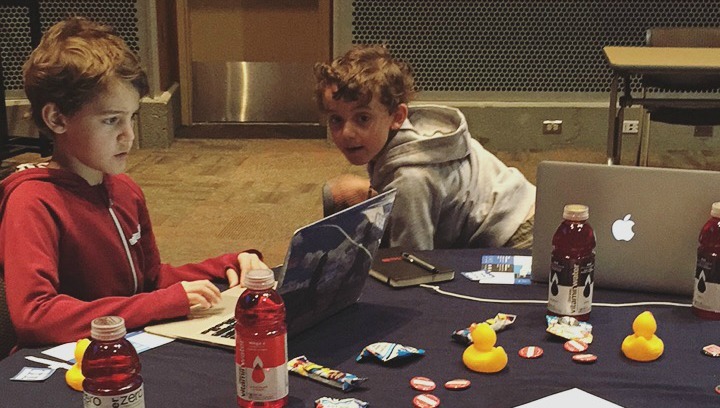 It could be said, by taking my sons to the HTML 150 coding sessions this week, I’m once again leading the pack by giving my kids the skills of learning a new language. 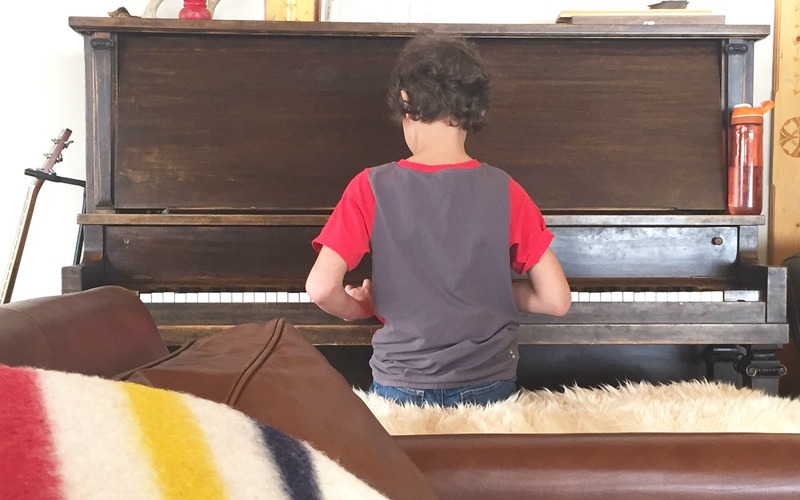 While I’m not sure if my sons will use French in their careers, I’m pretty sure coding will be part of their future. I stood back behind the camera, making a video of Zacharie doing an interview with the CBC about our visit to The HTML 150. 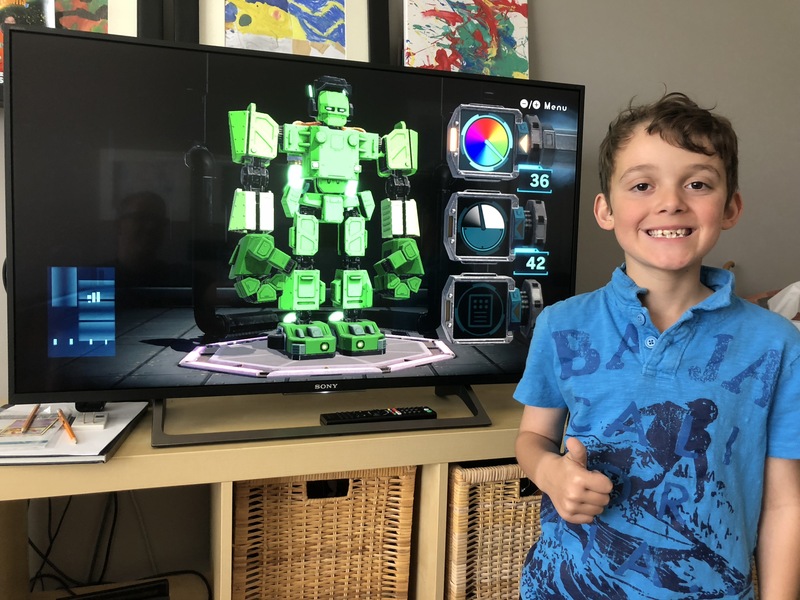 As one of the youngest participants (by about 20 years), the reporter wanted to talk to Zacharie about coding and why he thought it was important to learn. Fair enough, except Zacharie was doing this interview in French. 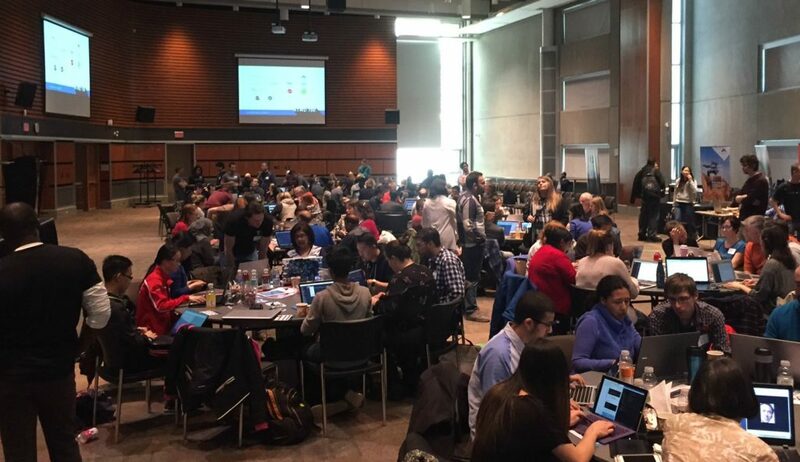 The HTML150 is part of HTML500, an event series that made stops in nine cities across the country with 2500+ Canadians of all ages participating in Canada’s largest free learn to code event. With high industry demand and a coding labour skills gap predicted to hit 200,000 jobs by 2020, the HTML150 provides free access for anyone looking to take ownership of their digital literacy. 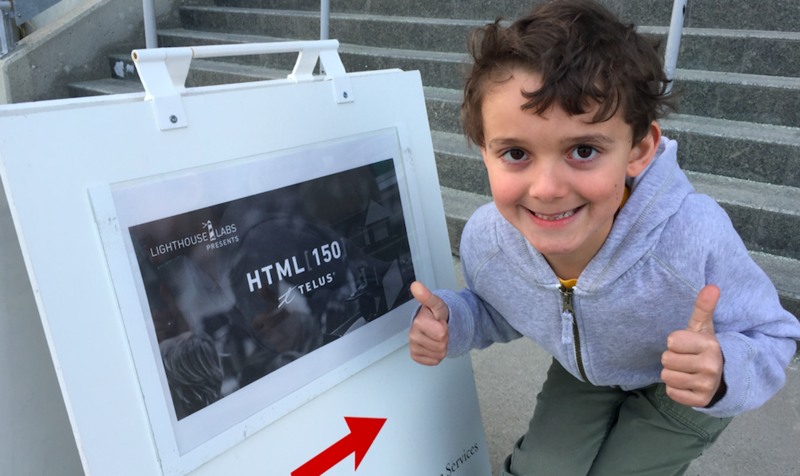 Lighthouse Labs is the key driver behind the HTML150, with their mission being to empower the next generation of developers, transforming the way tech education is delivered by making coding accessible to everyone. National partner TELUS Digital is working closely with Lighthouse Labs to bring the HTML500 to life. 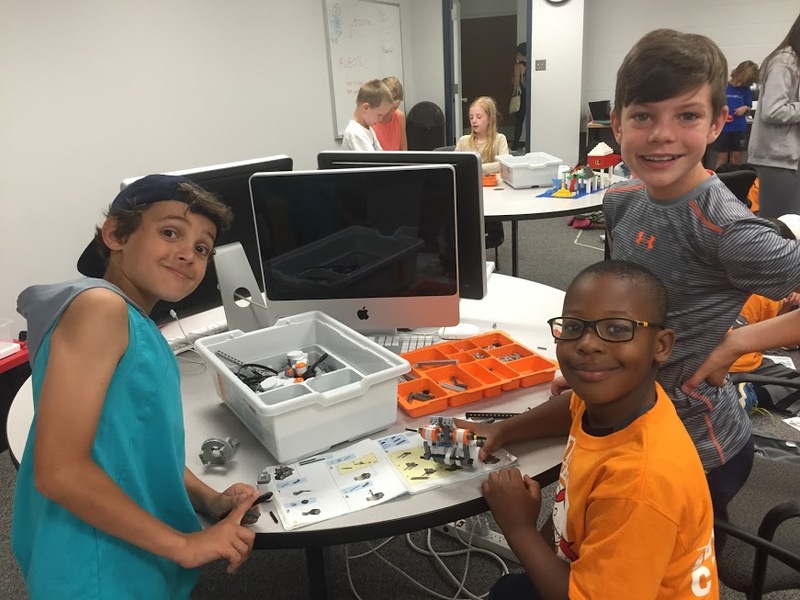 “It has never been more important for the next generation to learn to code, the future of job stability depends on it. We are excited about the opportunity that The HTML500 presents as a unique learning outlet for the growing Canadian digital market,” said Shawn Mandel, vice-president, TELUS digital. Many of those in attendance were people who had lost a job in the bad economic climate and were looking to pick up some skills to make them more attractive to employers. And then there were my two boys. The opening speeches bored them, and they ran off into the corner to play Minecraft while the sponsors talked about the importance of coding. Even the coding lessons themselves went a little beyond what they were prepared to pay attention to, but that didn’t matter – the class was about being hands on. I taught myself HTML nearly 20 years ago when I built my first website. I’m old school. I’m not an expert, it’s always been a hobby, but it’s served me well with my ability to turn out websites and learn about technology. My coding experience has created a very decent side hustle for me for the past few decades. With my experience, and the refresher from the lecture, I sat down with my boys to create some websites. 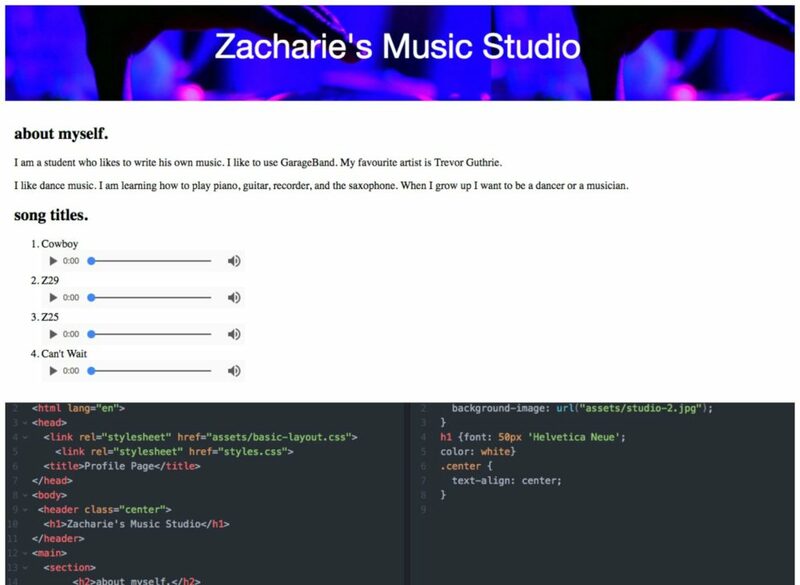 Now I did tell Charlie we would be making apps on this day to woo him along, so he was a little disappointed, but still dove right into listing commands, creating a homepage for where all the games and apps he hopes to create would live. We bailed early on the day before we could get to properly publishing our projects. Like I said, the boys were the youngest there and me bouncing between keeping them interested and coding their projects was exhausting. But they got a taste. 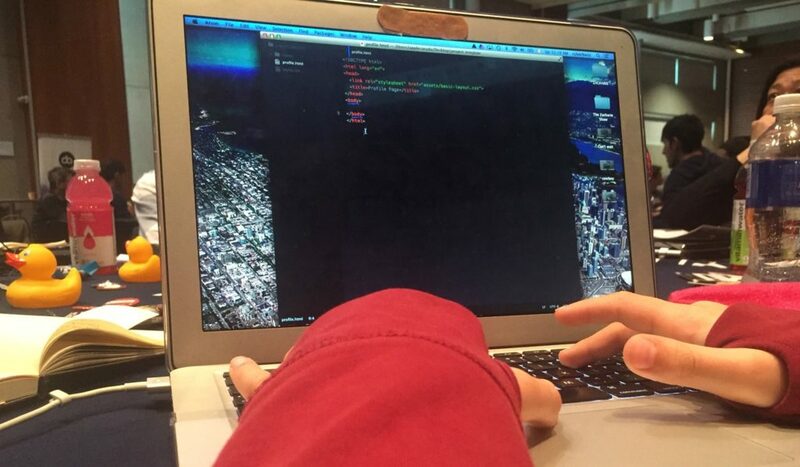 Coding IS a trade. It’s something that, once you know, you can work anywhere in the world. Just like knowing a second language opens new opportunities, knowing coding – even just the basics of HTML – can put you in control of the computers that will run our economy, giving you more opportunities. Atom – this is a free program you can use to build your websites with HTML and CSS. It’s wonderfully easy to use and the prompts to offer code tips, and different color coded elements to validate your code made it a breeze. 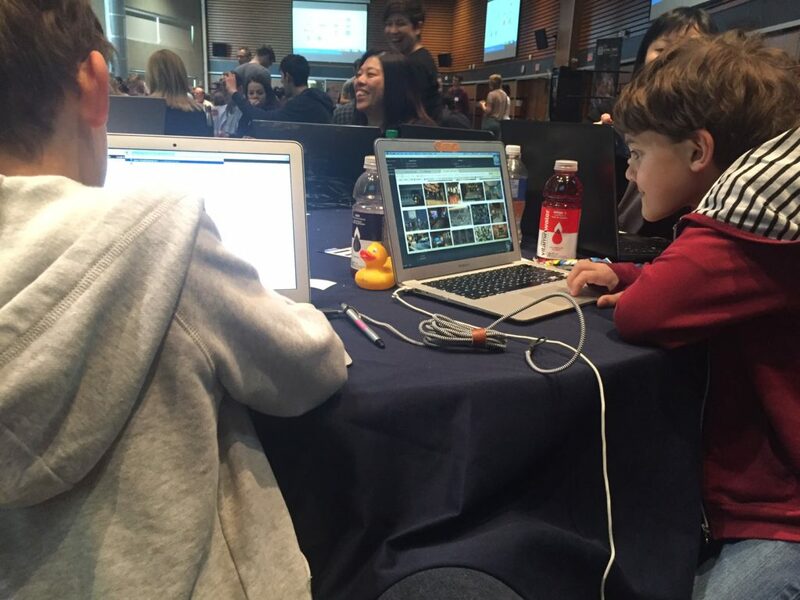 start.html500.com – this is the syllabus we used for our afternoon of coding. There are easy lessons and walkthroughs for many of the elements to get you started. W3School – a very handy website to look up common code commands and try them in a WYSIWYG editor before plopping them into your project. Lynda.com – one of the greatest education resources online is free with your library card. Get the card, get a Lynda account and learn at your own pace – for free. TELUS is a major sponsor of the HTML 500 and Ladies Learning Code. 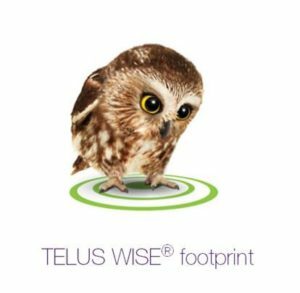 In addition to supporting digital literacy in terms of coding, TELUS Wise works to teach your kids online citizenship so they can stay safe online. More here.